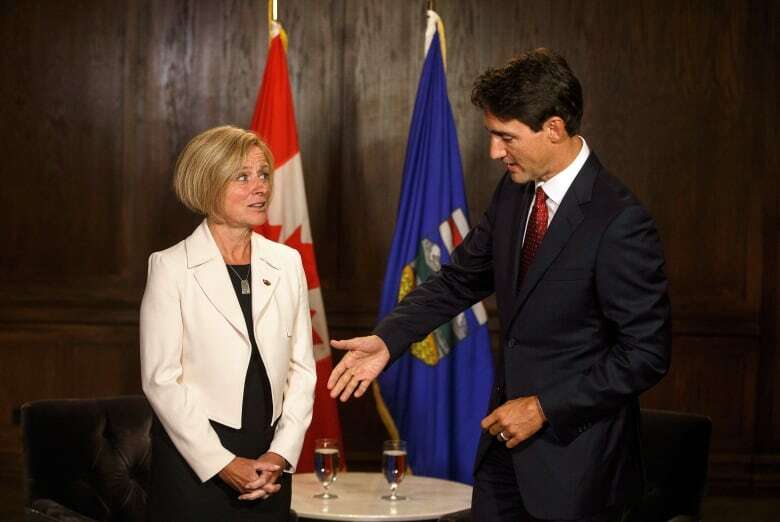 A visibly frosty Premier Rachel Notley met with Prime Minister Justin Trudeau in Edmonton on Wednesday to discuss next steps in resuming construction on the Trans Mountain pipeline expansion, following a court ruling last week that put the brakes on the project. In stark comparison to past meetings, the tension between the two leaders was apparent as they made brief statements to the media before their closed-door session. When she left less than an hour later, Notley was asked by reporters how the meeting was. "It was," the premier said. It was the first time Notley and Trudeau had met face to face since the Federal Court of Appeal last Thursday reversed a cabinet decision to allow construction on the Trans Mountain expansion. The court ruled the federal government had not done enough consultation with Indigenous people, and that the National Energy Board didn't properly consider the impact of an increase in oil tanker traffic off the West Coast. Hours after the ruling was issued, Notley demanded Ottawa appeal to the Supreme Court of Canada, or come up with a legislative fix. At an earlier event Wednesday in Spruce Grove, Alta., Notley said officials in her government have developed strategies to restart construction on the project while still respecting last week's court ruling. She would not reveal what those steps are, but repeated her determination to get the project back on track. "We absolutely cannot be held hostage to a regulatory merry-go-round that never ends," Notley said. Minutes after the court ruling was released, Kinder Morgan shareholders approved the sale of the existing pipeline and other assets to the federal government for $4.5 billion. The purchase closed on Friday, making the federal government wholly responsible for what happens next. Edmonton on Wednesday, Trudeau told radio station CHED that using what he called "tricks" to ram the project through might be satisfying in the short term but would create further legal fights down the road. Trudeau said the court ruled more consultation and study is needed and that's what his government intends to do. "Using a legislative trick might be satisfying in the short term, but it would set up fights and uncertainty for investors over the coming years on any other project, because you can't have a government keep invoking those sorts of things on every given project," he told the radio station. "People want to know that we are doing things the right way for the long term — that jobs that get started will continue and won't get stopped by the courts. That's the change we are focused on making." 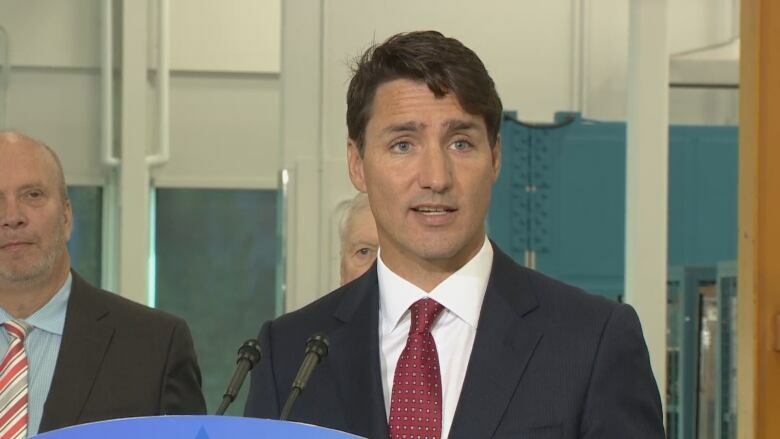 But hours later, in a news conference at the Northern Alberta Institute of Technology, Trudeau said legislative and legal options are still on the table. "We're looking at various options, including legislation, including appeals, and we're also looking at what we need to do to respect what the court has laid forward as the process necessary," he said. A decision on whether to appeal will be made "within the deadline provided to us," Trudeau said. The government has 60 days from last Thursday to request leave to appeal to the Supreme Court of Canada. Trudeau said the federal government remains committed to the project. "This really hurt as a ruling," he said. "What I tell Albertans and all Canadians is, 'We get it.' "
Alberta Independent Sen. Doug Black is also calling on Ottawa to trump last week's court ruling against the Trans Mountain pipeline with a series of legislative manoeuvres. Black is calling on the prime minister to recall Parliament and pass his private member's bill, which already has Senate approval. It would need additional language to say that Trans Mountain is in the national interest, but the bill could help the government get around the Federal Court of Appeal decision that effectively killed the pipeline, Black said. Black detailed his "roadmap" to construction in an open letter to Trudeau last week. "Our premier has called for bold action on getting Trans Mountain going, and I think my letter provides exactly that," Black said in an interview Wednesday with CBC Radio's Edmonton AM. In Edmonton on Wednesday, Trudeau rejected the suggestion that the federal government use legislation or a court appeal to get construction started quickly. Black said if Ottawa is serious about the pipeline, it must immediately adopt his private member's bill, Bill S-245 the Trans Mountain Project Act. Then, by either order-in-council or amendment to the bill, Ottawa should give the National Energy Board a four-month window to review the impacts of coastal tanker traffic and complete consultations with previously excluded Indigenous communities, Black said. Amendments to the bill could then ensure that temporary operating permits are issued to Trans Mountain. "I'm told that work has principally been done, so I don't think it's a big deal that the NEB needs to go back, dust it off, look at it and make whatever recommendations they need to make," Black said. Trudeau could resolve the conflict and put shovels back in the ground in a matter of months, Black said. "The prime minister will take into account what he hears and then frankly the permits need to be reissued," Black said. "We've spent enough time, enough talking, enough court cases. It's just time to build that pipeline." Black would also like to see Ottawa appeal the decision to the Supreme Court. Confusion around the legal duty to consult is squarely to blame for putting the Trans Mountain pipeline in limbo, he said. Without legal clarity, major national resource projects will face more rejection, he said. "We do not understand what the duty to consult is, and one court goes one way and another court goes another way. "What are the rules? What does proper consultation look like? It does not exist in Canada, so either the Supreme Court of Canada needs to define that or Parliament needs to define that." The pipeline wasn't the only problem on people's minds. A small group of Edmontonians highlighted their frustration with the federal government's Phoenix payroll system, which has plagued public servants since its launch in 2016. 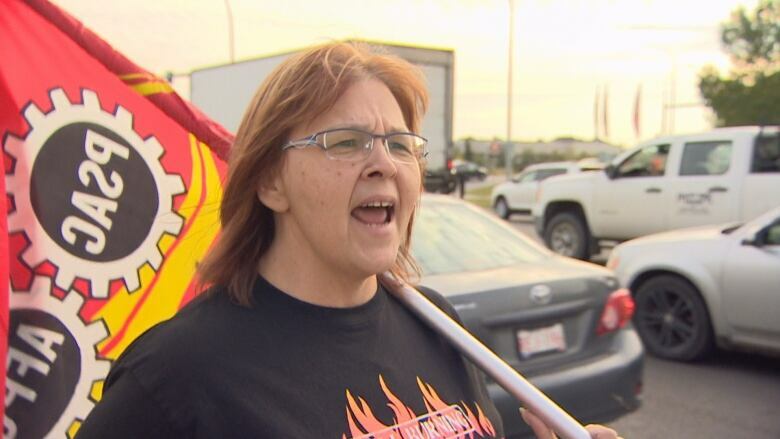 On Wednesday evening, dozens of people rallied outside of the Delta Hotel on Edmonton's south end, where Trudeau hosted a Liberal Party fundraiser. Government workers have been overpaid, underpaid or not paid at all because of the Phoenix system. 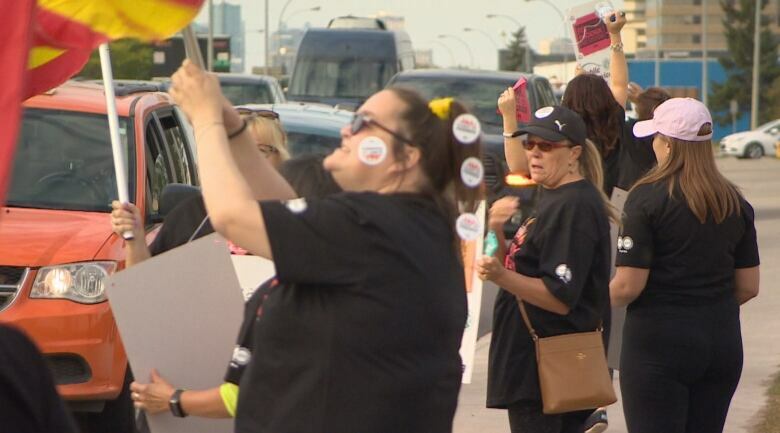 It has affected thousands of Edmontonians and they're tired of waiting for it to be fixed, said Marianne Hladun, vice-president for the Public Service Alliance of Canada's prairie region, which organized the rally. "There is zero confidence by any public service employee in their pay system at this point," Hladun said. "Our message to the Prime Minister is saying that you're fixing it is not solving the problems. These are real people that are impacted, these are real families that are impacted. And what [the government is] doing is not enough." Charmaine Nelson attended Wednesday's rally, and said she wants Phoenix abolished and replaced with a new system — and fast. The 2018 federal budget included $16 million to fund an exploration phase for replacing the system. Nelson went without pay for 10 weeks when she worked at Edmonton's Employment Insurance call centre. There were times she couldn't make rent. "It's very, very humiliating," she said. "Not only does it embarrass you. It just makes you feel worthless. It makes you feel upset and stressed out." The Public Service Alliance of Canada is calling for a national inquiry for the Phoenix pay system. "Because this is going to cost Canadian taxpayers billions of dollars," Hladun said. "We need to know how this happened, why this happened and to make sure that this never happens again to anyone else."